Hi there Doodlebug fans! 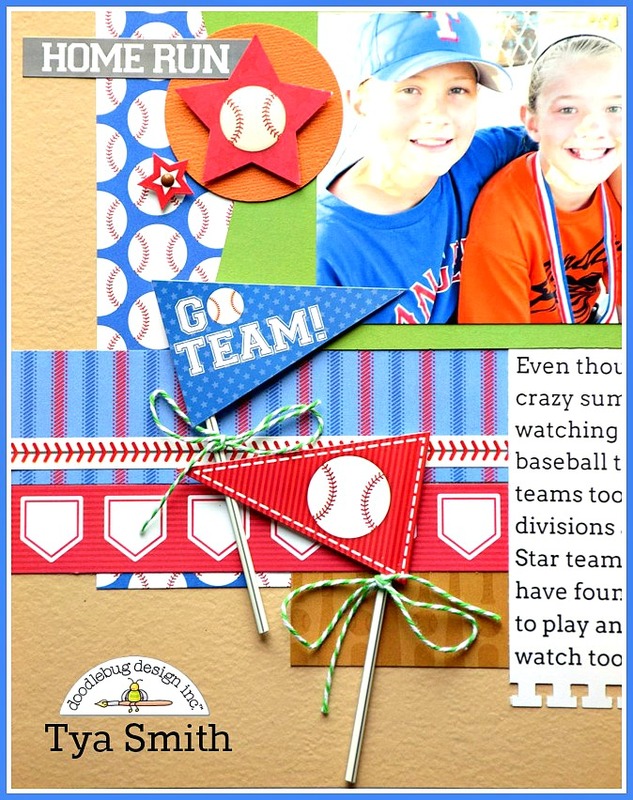 It's Tya here on the blog today introducing Doodlebug's baseball themed line called "Home Run" - and they really hit it out of the park with this awesome line! 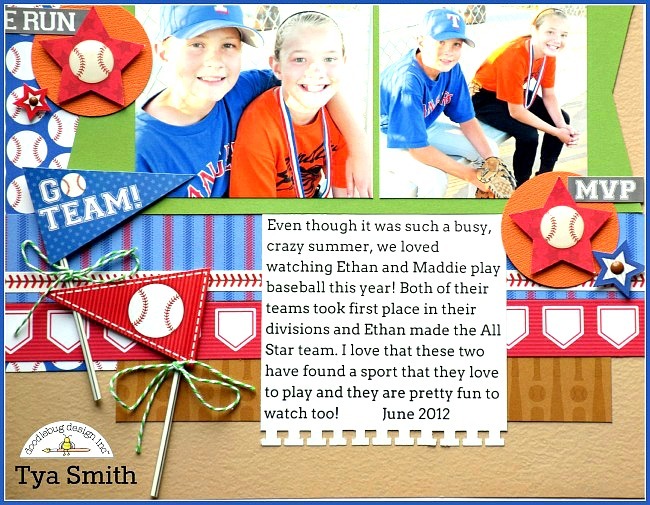 It was so fun to be able to scrap these fun pictures of my little sluggers! And as you can see - the line is perfect for girls and boys both! I had a lot of fun making this layout because the pattern papers that come with this line are so great! Tons of icons that perfectly capture this fun sport. I used some Ladybug Chippers letters for my title and the baseball Doodlepop added the perfect dimension I was looking for. The This and That sticker sheet has some really fun icons on them. I used the pennant stickers and combined them with some Pixies to make pennants. They added a fun and festive touch. I also added some word stickers and some star stickers from the This and That line as well. The little stars have a Bon Bon mini sprinkle in them .The stars have a baseball shaped Sprinkle to add a little pop as well. I added some journaling that I typed up on my computer and used a notebook paper edge punch for some dimension. Thanks for stopping by today and make sure to stay tuned for even more wonderful Home Run projects from my design team friends - we love these sporty lines so much! Happy Crafting! 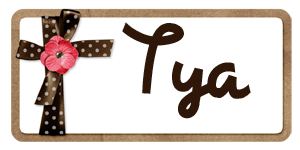 Tya, this is SO darling. Loving the pixies on the pennant banner! Awesome layout, love the gorgeous design! The pennant banner is my favorite embellishment!